Yu Darvish is a Japanese professional baseball starting pitcher for the Chicago Cubs of Major League Baseball. 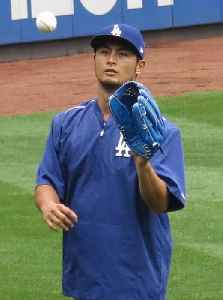 Darvish previously played in MLB for the Texas Rangers and the Los Angeles Dodgers and in Nippon Professional Baseball for the Hokkaido Nippon-Ham Fighters. In international play, Darvish pitched in the 2008 Beijing Olympics and the 2009 World Baseball Classic as a member of the Japanese national team.